This year’s presidential election has brought into sharp relief the fact that our justice system—in fact, our whole way of life—is in trouble. Crimes by the political elite, particularly those of Hillary Clinton and her cronies, are not being addressed by the criminal justice system. Instead, they are being swept under the rug and willfully ignored by both the justice system and the media. Our democracy is under attack and if we don’t take steps to protect it, we’ll lose it. America now has a two-tiered system of justice in which the political elites, including the Clintons, are not being prosecuted for their crimes. There is quantifiable evidence of state crimes perpetrated by the Clintons and the Democratic Party ‘mechanism’ that have not been investigated or if they have been investigated, the investigation is a whitewash. Obama and his banana republic pay-to-play justice system have committed a number of crimes against democracy. While many of these crimes have been extensively documented, the FBI and the Department of Justice refuse to enforce the rule of law (for information about some of these crimes, see https://www.youtube.com/watch?v=bC1Mc6-RDyQ). One of the most recent scandals surrounding Hillary Clinton (and only one of too many to name) is the issue with her emails. As secretary of state, Hillary transferred and stored classified documents on an illegal server in the basement of her home. Hillary then lied about it to Congress, to the FBI, and to the American people. In addition, Hillary gave her aides and many other “Team Hillary” employees access to classified information held on her illegal server even though these people had no security clearances whatsoever. This is not only against the law, but is also such an egregious breach of national security that it prohibits Hillary from ever receiving classified information or running for president. When questioned by the FBI about her emails, Hillary couldn’t seem to remember enough to give clear answers. In addition to her bad memory, Hillary’s aides, along with her lawyers’ aides, helped protect Hillary by destroying evidence through the use of BleachBit and hammers. Another long-time Clinton operative, Terry McAuliffe, also stepped up to help. His political action group “contributed” nearly $700,000 to the wife of Andrew McCabe, the FBI’s leading investigator of Hillary Clinton’s latest criminal case pertaining to the email scandal. Why did President Obama drag his feet insisting that his DOJ slow down the process? Why did the FBI do another “look away, nothing to see here” investigation of Hillary Clinton? The answers to these questions can be found in the recent disclosures by WikiLeaks. These disclosures show an email trail leading directly to Obama’s desk—even though he denied any knowledge of the incident. (See here https://www.youtube.com/watch?v=cnIA0QJWqEI). Several of Obama’s email addresses were in direct communication with Hillary’s illegal server—a fact that wasn’t disclosed until the email leak by WikiLeaks. The emails released by WikiLeaks and videos created by project VERITAS provide irrefutable evidence of not only systemic political corruption, but also of a series of purposeful, coordinated high crimes against our democracy orchestrated by the political elites. Our media have abandoned their responsibility, as prescribed by our founding fathers, to protect our Constitution and to ensure that our democratic system of checks and balances remains firmly in place. The media wilfully neglect to report on these real issues and will often downplay the criminal actions of the political elite. Sadly, the Democratic National Committee (DNC) and Team Hillary, in collusion with the media, have utilized the four Ds of divert, deflect, deceive, and deny in an attempt to achieve the predetermined result the elites expect from this $5 billion farcical presidential election. The media colludes with the elites by refusing to seek answers to the tough questions. Why did the FBI allow Clinton and her staff to testify in secret and not under oath? 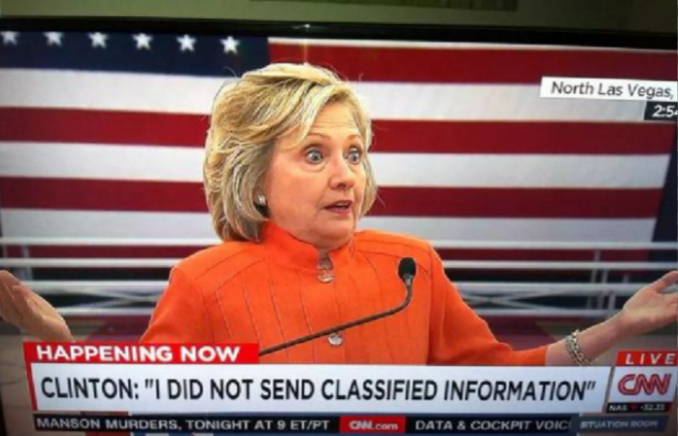 Why was Hillary’s advance receipt of CNN’s Presidential Debate questions not a crime? Why was immunity granted to Clinton’s staff? Why did the FBI not seize all of the electronic devices from Clinton’s staff and examine them? How and why did the FBI allow the willful destruction of evidence in this case? And social media doesn’t seem to do any better. Although, it can be used to educate and inform, social media is typically utilized as a method to crush dissent and differing opinions. If anyone dares to question elites such as the Clintons or claim that the Clinton Foundation is “above the law,” they are immediately attacked and denigrated. Too many Americans rely upon popular comedy satire shows such as SNL, Colbert, Fallon, Kimmel, John Oliver, Facebook, and the Kardashians as their only legitimate, credible news sources. Most fail to identify this “programing” as risible spin so unbelievable it is capable of making Joseph Goebbels blush. The email scandal is not the only criminal issue surrounding Clinton Inc. and Hillary’s cabal. Two other criminally prosecutable offences are being ignored by the media. During the Democratic primaries, the DNC conducted an illegal, systemic attack aimed at derailing Bernie Sanders’s presidential campaign. Even though clear evidence of the DNC’s campaign to usurp democracy has been brought to light, nothing has happened. In fact, Debbie Wasserman Schultz, the person who orchestrated this crime, stepped down as chairman of the DNC only to be promoted within Hillary Clinton’s campaign. She delivered the goods and was given her thirty pieces of silver. In an effort to ensure Obama’s 2012 re-election, Hillary Clinton, crafted a “false narrative” about a movie being responsible for the Benghazi attack which led to the murder of US Ambassador John Christopher “Chris” Stevens and three CIA operatives: Sean Smith, Glen Doherty and Tyrone Woods. The recent emails provided by WikiLeaks prove Clinton knew terrorists were responsible for these attacks, yet Clinton, over the flag-draped caskets of the dead, lied to the families of those killed and to the American people to ensure the re-election of Obama. No agency has investigated this timeline or the correlation. The elites ensured that terrorism was not mentioned until well after the 2012 presidential election, and when Congress called for populist investigations, Clinton lied with impunity, and Obama’s apparatchiks swept another one under the carpet. The elites win again; America and Democracy loses. These coordinated crimes against democracy by the political elites are often dismissed as conspiracies, but I argue they are not. They are crimes against democracy aimed at moving forward specific political agendas. This is precisely what the Declaration of Independence warned us about. What’s very scary about the situation our country finds itself in is how our political elites, in concert with their media propaganda bullhorn, spin the idea that the public’s growing distrust is corrosive to government authority and democracy, leaving the elites with no other option but to censor the Internet. Everything that is happening in our country today needs to be stopped. We need some somber honesty from politicians. We need impartiality, transparency, and accountability from our FBI and DOJ. Unfortunately, with Hillary, Bill, and Clinton Inc. we will not get this. Hillary, Bill, and Clinton Inc. are terminal forms of cancer, dredged out of Washington’s cesspool of corruption. So, while Trump may not be perfect, he’s a better option than terminal cancer. It’s high time to drain Washington’s cesspool of corruption and ensure that our democracy is protected from those who would destroy it. One Responses to Democracy, Oligarchy, Or Tyranny: It’s America’s Choice—Or Is It?